Celebrity sightings are well within the realm of possibility during a night out at LAVO, located directly on Las Vegas Boulevard. Settle in and treat yourself to the award-winning Kobe Meatballs served with sausage ragu, whipped fresh ricotta and garlic crostini. For dessert, grab a few friends and try the Strawberry Skyscraper. 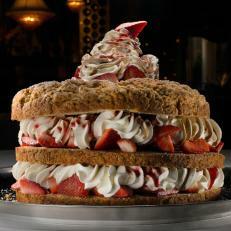 This towering creation is brimming with shortcake, fresh whipped cream and pounds of strawberries.